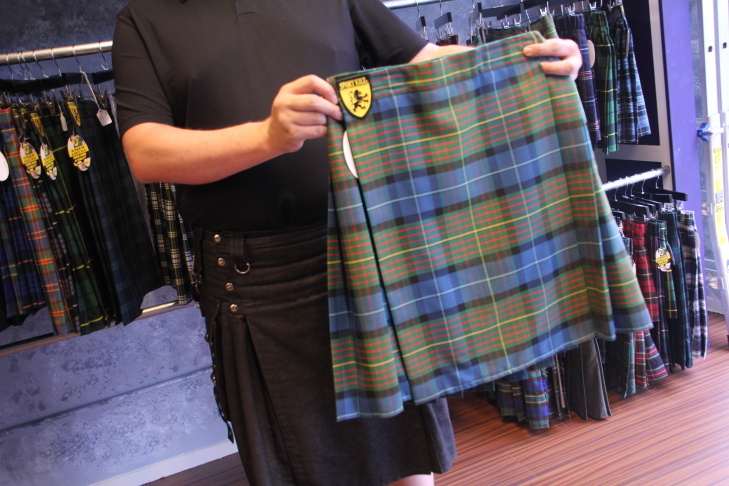 Pasadena's Off Kilter Kilts carries a selection of traditional and modern kilts. Stefanie Harbeson of Off-Kilter Kilts can help you pick out a kilt with a tartan pattern that can be traced back to your European roots. Off Kilter Kilts J.T. 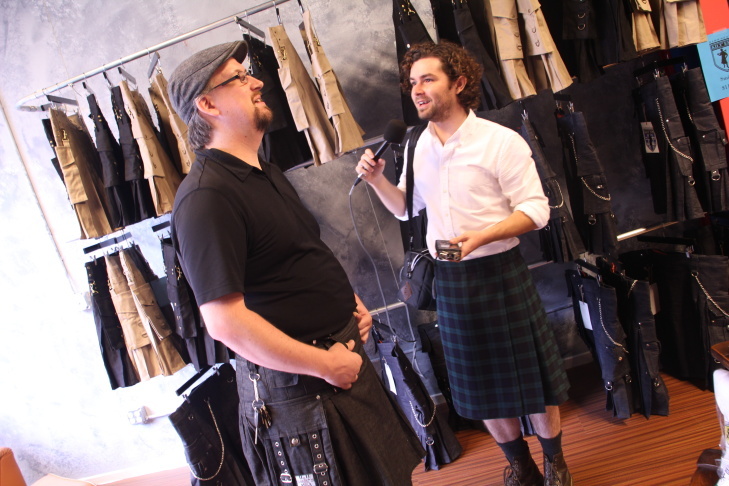 Centonze and Off-Ramp contributor Robert Garrova talking kilts. 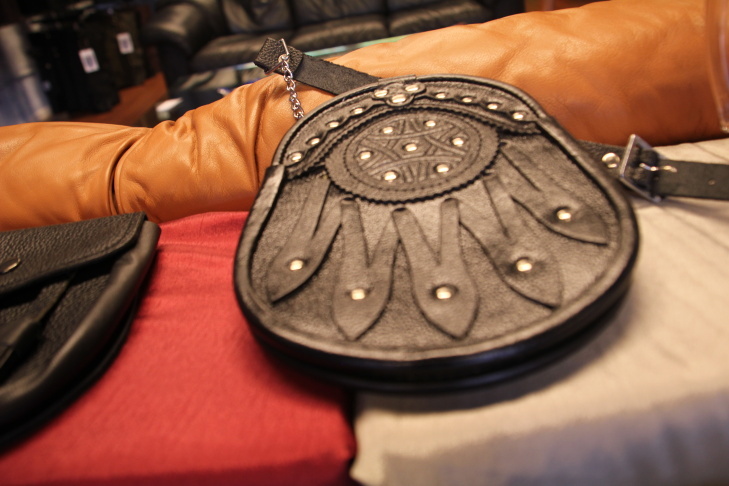 Off Kilter Kilts also sells the sporran, the pouch traditionally worn with a kilt (kilts of old had no pockets). J.T. Centonze wasn't content with shopping for his bottom half at Renaissance Faires and Highland games, so he opened Off Kilter Kilts. The kilt. That pleated skirt of old may seem like a garment specific to bagpipe players and the Scottish. But thousands of miles from Scotland there’s a community of daily kilt wearers — or kilters as they’re known — right here in California. After all, Kanye wore one, and H&M sold them for a while. 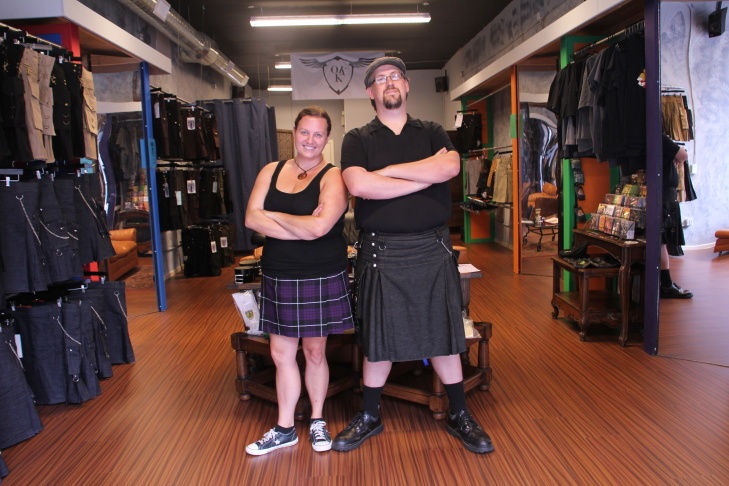 And now, on East Colorado Blvd, there’s Off Kilter Kilts, SoCal’s first multi-brand retail kilt store. Owner J.T. Centonze knows all about kilt culture. “We like to refer to it as Kilture,” Centonze says. There are a surprisingly large number of guys out there wearing kilts, according to Centonze. 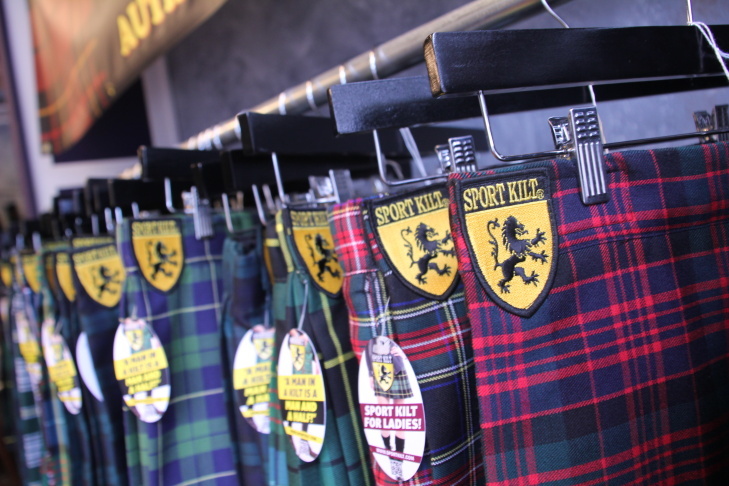 Off Kilter Kilts is a one-stop shop. Centonze sells the traditional pouch called the sporran that’s worn like an ancient fanny pack, and he has kilts for toddlers, too. He even sells the music you should listen to while wearing a kilt. But as a daily kilt wearer, Centonze wasn’t content with shopping for his bottom half at local Renaissance Faires or Highland Games. The modern kilts he carries in the shop are not costumes. 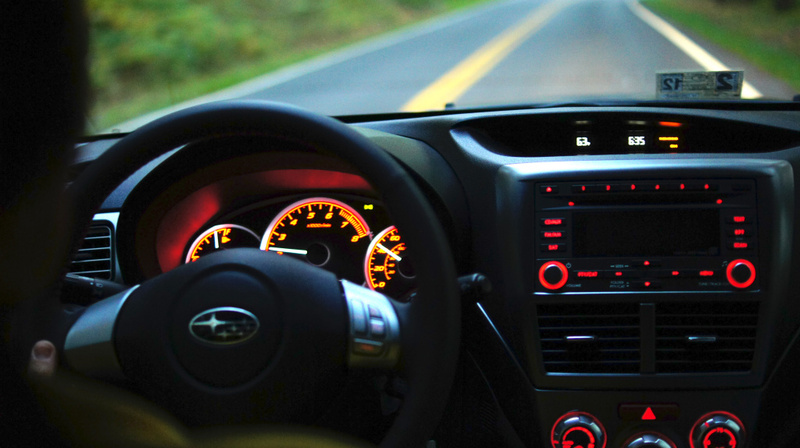 “We can put you in a kilt for construction work, we can put you in a kilt for office work, we can put you in a kilt for the golf course or basically anything in between,” says Centonze. 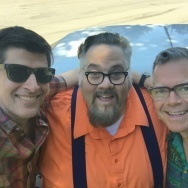 And that means Centonze is also a purveyor of what’s known as a utility kilt, a sort of mix of pleated skirt and cargo pant, some of which can carry almost a 12-pack of beer. 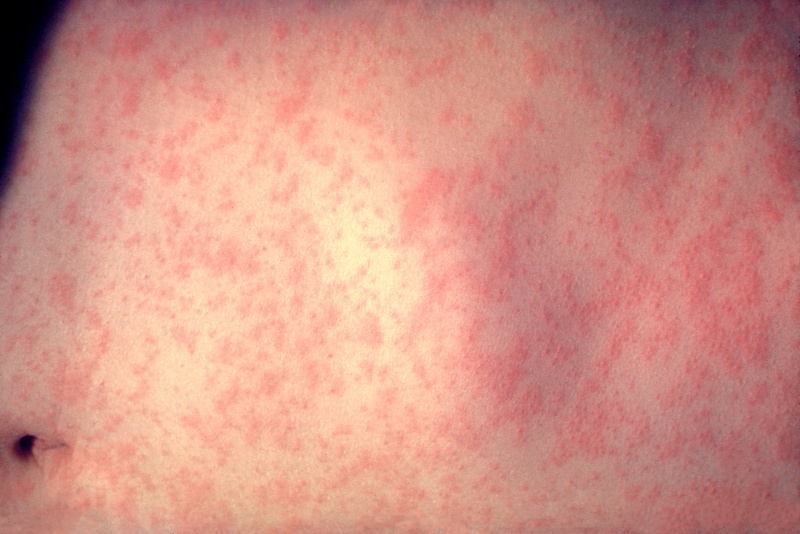 “That’s their claim to fame,” Centonze says. But, if you do want to go with a traditional kilt, you’ll have to pick out a tartan — that’s the criss-crossed pattern seen on Scottish kilts. 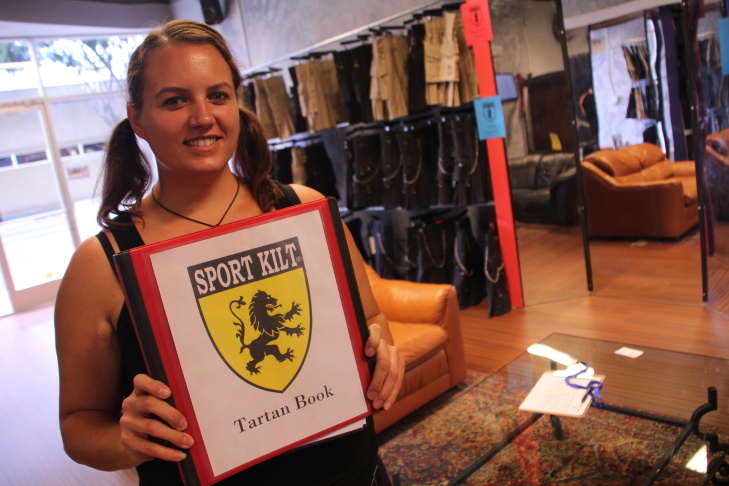 Luckily, Off Kilter Kilts has Stefanie Harbeson, resident tartan maven. Harbeson says Off Kilter carries the common Wallace Clan tartan and the Blackwatch tartan, which the Scottish army has been using for almost 200 years. They even have the official tartan for the State of California. Harbeson can also help you pick out a tartan that can be traced back to your Scottish roots. But what are you supposed to wear underneath a kilt? Centonze admits he still has work to do when it comes to convincing men to ditch their pants. 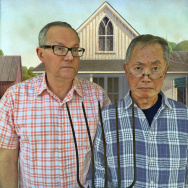 “Because, quite frankly, they’re still a little worried about it,” he says. 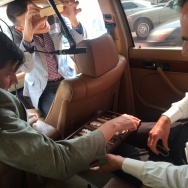 But tartan expert Harbeson offered one incentive.